We go to seminars and workshops and listen to successful people talk about their success. But the things that change us most are struggle, failure, adversity, and endurance. The deepest gifts you offer the world are purchased by working through challenges, enduring disappointments, and solving struggles. The way you think about the past clarifies your greatest contribution, unless you haven’t learned from your struggle and mistakes. Going through fire provides double benefit. First, you gain practical know-how. Second, and more importantly, you gain humility and compassion. Character is formed in the crucible. Knowledge gained from experience helps many, but the richest benefit you bring is who you are. Who you are matters more than what you know. Your response to adversity makes you who you are. Gentleness with strength. Harshness traces to weakness; gentleness to wisdom. Inexperienced leaders often try to prove their strength with aggression, harshness, or rigidity. Kindness with confidence. There is no self-abasement with the kindness that comes from facing adversity well. Passion with steadiness. Endurance makes leaders less susceptible to drama. Success affirms us. Adversity makes us. Wisdom that comes through endurance understands the value of relationships. 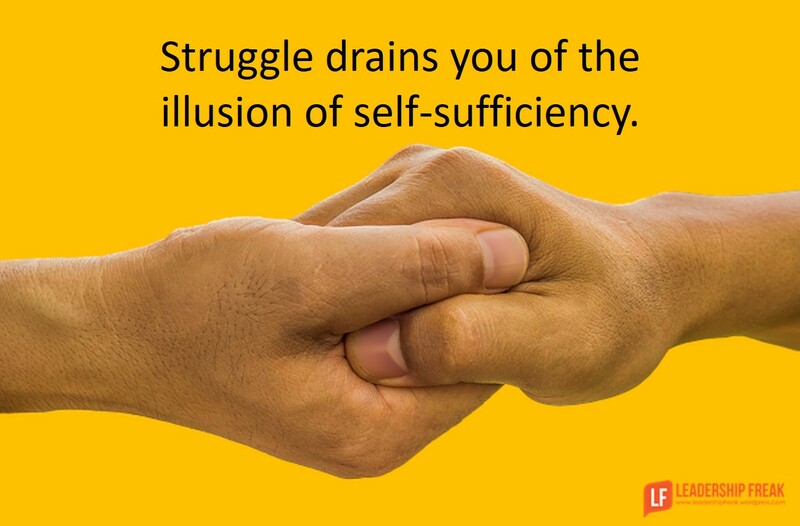 Struggle drains you of the illusion of self-sufficiency. Wise leaders build relationships before they’re needed. Foolish leaders ignore or weaken relationships. Wisdom that comes through experience knows how to challenge and support at the same time. Perhaps the greatest benefit of endurance is the ability to hold people to high expectations and support them at the same time. How do they value relationships? Who are they learning from? How are they strengthening relationships between others, especially team members? How do they hold high expectations and provide support at the same time? What has endurance taught you? 2. A concept borrowed from the famous high wire act, the Wallendas, which is to focus all your energy on getting to the other side. If you think about failing or falling you will. Thanks Brad. Powerful lessons. One thing I’ve noticed is that deep lessons may seem trivial to those who have not worked through the issues. Wow what a powerful lessons I really need to be a part of this convesetion. Thanks Shweleza. Best wishes for a great new year. Dan, your message today is HUGE for me! “Who you are matters more than what you know.” Thank you for solidifying what we sometimes lose in our daily walk as leaders. We tend to put more emphasis on our experience and lose sight of who we really are. The job/task will get accomplished or not, based on who you are.